College hockey may be coming to Versus! 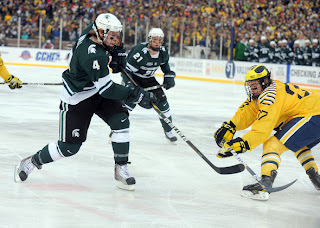 There have been rumblings that Versus is going over the possibility of televising regular-season college hockey in January. The hard facts of what conferences would be covered and what night the games would air are still unknown. The NCAA National Tournament has been covered on ESPN, ESPN2, and ESPNU in the past. But regular season games have never been regularly covered by a network. This would be a huge step forward for both college hockey and hockey in general. I have been disappointed on many occasions when I come across a Boston College game on the tube just to find a "call customer service to order package" message. I would welcome this deal and college hockey into my front room with open arms.